Songwriter Biography: Frederick George Moore aka Freddy Moore, Rick Moore, Skogie Moore. Freddy Moore - born Frederick George Moore in Minneapolis, Minnesota. "I was born by The River in a little metropolis"
"One of my proudest accomplishments, as a songwriter, was seeing my compositions side-by-side with songs by Kink: Ray Davies, and fellow L.A. songwriters: Brian Wilson, Danny Elfman, Joan Jett, (and others), on albums compiled and released by Rhino Records." Moore's band was later acknowledged by no less than Creem magazine as having been one of the first power-pop bands known to man. "Freddy Moore will one day be acknowleged as one of the great lyricists of his generation." Frederick G. Moore was born in Minneapolis, Minnesota. He was called 'Ricky' by his friends and family. Each year when each new teacher would call "Frederick Moore?" Moore would ask to be called 'Ricky', the teacher would immediately dub him either 'Ricky Ricardo' or 'Ricky Nelson'. 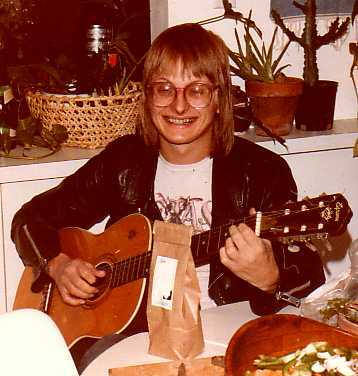 Thereafter Moore knew he'd end up being a singing guitarist someday! "I was always drawn to stringed-instruments: ukuleles, violins, and guitars." When the Beatles hit the US in 1964 Moore redoubled his efforts to master the guitar. Four months later (June 1964) he moved to California. He grew a Beatle cut and got into hassles with surfing, hot rodding school associates. "I didn't have any friends and really didn't want any. I just sat in my room and played Beatle songs and wrote my own." Moore poured through rock fanzines, absorbed and dissected every Beatle album that came out, and listened exclusively to the Fab Four and the Kinks. By October 1964 he had unequivocally decided his vocation was playing rock and roll music and he started writing. "I noticed on the record labels that the Beatles wrote their own songs, so I figured that to be a professional rock musician I should write my own songs." "In the summer of 1964, right after 'A Hard Days Night' came out, my cousin Dann Wick and I spent two weeks making wooden replicas of the Paul McCartney bass, the John Lennon rhythm guitar, George Harrison's lead guitar, and Ringo's drums. We used to lip-synch to records. Danny and I wanted to play real music, the others wanted to lip-synch, but we finally got them going. We learned 'You Really Got Me' by the Kinks, the Beatles' 'And I Love Her' and my first original composition 'Baby Be Mine'." Moore pursued his musical ambitions with the same vigor most 13 year-olds apply to major league baseball aspirations. He started putting together bands and teaching reluctant copycat cohorts to play his songs. His narrow interests and extreme diffidence made finding other players difficult. "When I was in the tenth grade, a new guy moved into our neighborhood. I had heard he played guitar, so one day when he was walking down the street I put my amp in the window and played my guitar at him to attract his attention." The two got Moore's first serious group together, but in January 1966 Moore returned to Richfield with his parents. Moore continued his apprenticeship with the media in Minnesota, keeping to himself, teaching friends to play, writing prolifically, and growing up with the music, always one step ahead of the trends. He and friend, Steve Brenner spent summer afternoons writing more songs and arranging them for ensembles of fluctuating size. The groups would meet early in the day, rehearse the previous day's song, discard it or tape it, and then begin work on another song. (When Brenner was not available Moore collaborated with his cousin David Burdick another prolific songwriter). Moore did the same thing with other people's music playing through works like the Beatles 'white album' at a rate of two or three songs per day. "During the summer of love, Craig Laursen and I sat in the basement and turned out all the lights and jammed out San Francisco music. We alternated rhythm and lead for a million hours." By the end of the summer, Moore was a creditable lead guitarist. Moore's listening interests broadened, and he continued to single-mindedly pursue guitar virtuosity and related skills like arranging and recording music. When he graduated from Richfield High School in 1968, the outside world intruded in the form of the draft. To escape, he enrolled at the University of Minnesota to study Music Theory and Composition under composer Dominick Argento. For Moore, who had spent most of his youth hunched over a guitar and tape recorder in his bedroom, his college years were a watershed experience. "I found an organ in Scott Hall, and I was playing around with that one afternoon and somebody came in. I thought I must be using his organ time or something, but he said it was alright, and that he'd show me how to use it, which he did." The organist (Randy Pink) said he was forming a group( The Pink Project), which never made it beyond the rehearsal stage, but before his association with Moore ended, he had interested him in Thelonius Monk and other jazzmen, besides starting him on keyboards. "I'd go to school and play piano all day, and I started missing classes." "When I got into U music, professor Argento would illustrate his points by pounding something on the piano. It always came out sounding like the Mothers. I thought it was pretty cool, so I started listening to the Mothers more." Frank Zappa joined Lennon, McCartney, and Ray Davies as an audible influence on Moore's writing. Moore's Richfield reputation grew on a small scale. The local cover band (Escher, Winger, Weiss and Bates) paid a visit to the reclusive songwriter and asked him to supply them with some original compositions, after he had taught them several of his newest songs they asked him to join. Moore refused politely, but said they could join HIS group. By Fall, 1969, Frederick G. Moore had written out the chords, melody and lyrics for over 90 songs; forgotten or lost perhaps 90 more; begun his second year of college, learned to arrange, score, play guitar, piano, organ and drums, still wanted to be a rock star, and had rarely played in front of an audience. He was 19. Rehearsals were 7 nights a week when there are no gigs, The Euphorium was a corner basement room with 5 years of rock music caked on the walls in Day-Glo paint. The only window was splintered from having amplifiers pushed through. The Euphorium was carpeted with wires and partly lined with eggshell cartons. Mounds of crushed paper paid tribute to Moore's mania for list making: lists of songs, lists of equipment for every eventuality, and finally, the shirk list adorn the walls. Shirk list honors went in the form of shirk-iota's to the man who dreamt up the heaviest method of circumventing work. Moore always won. The Pachucos spent most of their rehearsal time working out complex song arrangements. Moore pulled thirty songs from the 200 he had written out or saved on tape and each week a new one was drawn out of a hat. A song was usually ready for performance after one week of arranging and an additional week of rehearsal. The band would close down rehearsal at the Euphorium any time from 10:30 to 12 PM, and sometimes would go all night. Arranging the never ending stream of work from as prolific a composer as Moore, could get tedious and often did when ideas were sparse. The situation was complicated by the group's obsession with doing things unconventionally or conventionally, but better than ever before. Moore's day would begin a few hours after the previous evening's rehearsal ended. Sleep and getting a driver's license fell into the same category for Moore: things for which he didn't have time. Getting out of bed in the morning, he reached for his guitar before his toothbrush. His suitcoat was stuffed with lists, notebooks and guitar picks, as well as a portable toothbrush he could use when he had a moment. No matter what time he got up, at 12:00 noon sharp he worked on one or more of the 13 songs he was presently writing. He usually didn�t write anything down until it�s completed, so as many were lost as finished. Afternoons were also the time he used to pursue his personal research projects. Moore also had a massive tape collection, including reels of nearly every musical group he has ever put together. Some of The Pachuco's repertoire was in its fourth or fifth arrangement. Some songs such as "Magic Lock" go back to early 1967. "Colonel Arnold�s Cross," "Collins Park Rock," and "Wolfman Strikes Again" date back to 1968. Moore recalls how he wrote the latter: "I wrote that the night Morrill Hall at the U of M was seized by anti-war protesters. I saw something happening at Morrill, and I got up on this pediment to see, and I slipped and fell about ten feet down into this contruction pit. I thought of the first line just as these protesters were pulling me out, and I wrote the rest of the song as I was walking down the campus mall. When I got home it was pretty hard to figure out the chords because all I had were these words and melody in the back of my mind." Moore wrote whenever an idea hit him. He�s written songs riding his bicycle to the store ("Blueberries For Baby"), lying on a pool table at MacPhail Center while waiting for a ride ("Tonight�s The Night") and when inspiration reaches out from a record he hears. Everything in his narrow, reclusive world and everything the media throws at him received his musical scrutiny: "I like to get onto something and thoroughly check it out. I might read about somebody I�ve never heard. So I�ll go out and get their record, and then I�ll read about their influences, so I�ll research their influences." "Every week I have a new favorite to listen to. Ray Charles, the Beach Boys. Whoever I�m listening to, that�s my influence for the week. This has helped me expand musically to the point where I have no specific tastes. I am interested in all types of music." Arrangements came from even earlier periods in Moore�s musical history: "We could be doing different songs. These just happen to be the ones we�re doing. All of them would come out just as well if we worked on them just as hard as the ones we�ve got. Perhaps not all � but certainly as many as we�d ever want. We really can�t have any use for 200 songs." Moore would grab a quick bite to eat around 6:30 PM. At 7 PM Peterson and Galles would pick him up and drive to the Euphorium for another rehearsal. Skogie still holds the attendance record at One Groveland (the Minnesota equivilant of Liverpool's Cavern Club), they have jammed as many as 450 paying customers into that cramped hall. When their set was over they would usually wait offstage for a signal to go back and do their final song. When the band jumped back on stage the girls would start screaming. They knew what was coming. Moore was one of the best movers I have ever seen. He recieved a lot of crude fan mail from girls. At the end of the encore, Moore would fall face-first off the front of the stage. The crowd, in a total frenzy from three hours of Pachuco music, would lift him triumphantly above their heads. The whole atmosphere of a Skogie concert was different from most other concerts. As usual there was the reek of cigarettes, pot, and beer, but there was always a few groups of hard-core Skogie fans who were really into the deeper aspects of the music. The first night I ever heard contemporary power-pop and the first night I ever saw Frederick "Rick" "Skogie" Moore were the same unerasable evening. It was at a University dance circa 1972, a time when it seemed like every other ambitious local band wore lots of purple satin and learned their key riffs off the Yes album. During the Elvis classic "Teddy Bear," Moore whipped out the real item and proceeded to fearlessly demonstrate some arcane maneuvers of stuffed bear-human being relations. Years later Moore and his boys were forever banished from Miraleste, a Palos Verdes penninsula High School in California for the same inventive play of passion. Skogie released a single in June 1972 with the help of producer/manager David Zimmerman (Bob Dylan's brother), and released a follow up album in 1974. Moore's band was later acknowledged by no less than Creem magazine as having been one of the first power-pop bands known to man; during their six-year residency (1970-1976) as Minneapolis' strangest, they were indeed an anachronism. California laid claim to Skogie (four out of five Kats belonged to that band) in 1976, after extensive national touring and recording experience at three Minneapolis studios hinted at unexplored musical and circumstantial possibilities. Los Angeles was not clutching it's breast in anticipation. "The reception was as abysmal as you can imagine," Moore laughs now. For a good while the band did a Jekyll and Hyde. Skogie also played original music dates as the Kats, while Skogie became a dance band doing lots of cover material, lassoeing lots of fans, and happily rediscovering unmitigated pop after trying other genres for size. There were moments of longing for home on the range. "One of the first things we found out is that Minneapolis audiences respond to a much more intellectual performance than L.A. audiences. And in L.A., attitude is crucial. They want to be told what's hip. The bands simply have to act like they know what they're doing, no two ways about it." Hip in El Lay circa 1978 had it's finger pointed to new wave. "We were in the right place at the right time - making bad business moves. Frederick G. Moore soon became the San Fernando Valley's answer to England's Jeff Lynne, the guiding influence behind the Electric Light Orchestra. Although ELO's orchestrated pop style bears absolutely no resemblance to the rocky bebop sound of Moore's group, The Kats, the two bands have one thing in common -- strong leadership. Like Lynne, Moore functioned as his band's lead singer, rhythm guitarist, sole composer and conceptual designer. But Moore carried his role as star cat one step further. Onstage he was riveting, especially when he unstraped his guitar midway through each set. Unencumbered, Moore prowled the stage in search of his quarry. He often bypassed his fellow band members -- younger brother Bobbyzio (sax), Dennis Peters (bass and vocals), Al Galles (drums and vocals), and Pete McRae (lead guitar) in favor of forays into the audience. Young girls responded by enticing Moore toward them with promises of cat food tidbits from Purina and Friskies boxes. The other Kats were pelted with handfuls of dry kibble while Moore bounded back on stage, scrambled on top of an amplifier, and made dramatic feline leaps, marking the end of one song and signaling the beginning of the next. When it came to everyday life, however, Moore's nervous system sliped into a relaxing lower gear. Stripped of his flamboyant stage mannerism's, he came across as an affable fellow, who looks rather intellectual due to the thick black rimmed glasses he wears when not performing. And it soon became apparent that his appearance was not deceiving since Moore's conversational wit revealed a sharp mind. The Kats uniqueness was largely the result of one of Moore's most engaging concepts -- an individual appropriately named Freddy, an underdog or in this case an underKat. Buoyed by the band's good-natured rock 'n' roll vibes, this song pattern eventually evolved into a rock opera of sorts. The theme was so subtly presented that Moore's songs did not seem contrived, unlike many rock concepts. "We don't serve up a plot per se but each number ties into the next," explained Moore. "Freddy's problems continually crop up throughout the group of songs we perform during each set." Moore said he has enlarged upon his own personality to create the character he portrays on stage. "Freddy's just an inexperienced little guy who's not really cool but constantly tries to convince his friends, as well as himself, that he truly is a cool individual. I used to be and probably still am, a nervy, punky kid living in suburbia always fantasizing about being where the action is." He threw up his hands in amused exasperation and laughed. "Here I am, living in Arleta and its all happening on the Sunset Strip. That's the message behind "Street Life" in which Freddy sings of his longing to escape from the dull routine of middle-class suburban life." "He dreams about hanging out in an area like the West Hollywood rock scene but his dad won't let him have the car, his friends won't cart him out there and he's too chicken to hitchhike. So Freddy has to stay home and live vicariously by reading rock magazines. Our theme song, 'The Kats' relates directly to this situation of being stuck inside like a house cat who's only desire is to jump through the screen door and join all the free roaming alley cats outside." Of course Moore was no longer stranded in suburbia. He may have lived in the northern outskirts of the Valley but his status as lead singer in a popular local attraction was anything but dull. In the song "My Life's In The Bag," Moore posed the question: Where do we go from here? The answer to Moore's question appeared obvious. The Kats, who were on the verge of signing a recording contract, were more than ready to graduate from the local L.A. rock scene. Note: Around this time Moore met his second wife Demi (the relationship lasted 6 years). Infinity Records won the bidding war and rushed The Kats into Shelter Studios on Sunset with Tom Petty's production team. Just as final mixes were being completed Infinity Records was disolved by its Dutch parent company. There was no one left to pay the Shelter Studio bill so " The Kats - Get Modern " became known as "The Great Lost Kats Album". It remains locked in the Shelter Studios vault. Moore had time for only eight of his tunes but was able to show a clear thematicawareness that his life in the Valley is both separate from and entirely similar to that of his new wave colleagues. When Moore does their theme song, "The Kats," they become an interesting visual group as well. Musically, the Kats have a lot in common with the spiritedness of the '50s sax-influenced groups stretching clear back to Bill Haley and the Comets; they've also digested the mid '60s first generation punk and have a clear understanding of the technical advances made in the '70s. The cartoon star of the Kats is lead singer-songwriter Freddy Moore, a runty fireball who looks like Frank Gorshin after being hit on the head � by an anvil, undoubtedly. Moore begins hopping his little body around the stage the instant the spotlight hits him, and once started, he never stops: He pops his eyes, flails his arms and bends his fingers in time to the beat, acts out his songs with gestures so broad they become visual puns, and leaps into the audience to literally collar an innocent patron into loving him. Oh yes, Freddy also sings. He sings in a scratchy but muscular voice over the raucous wails of two guitars and the saxophone of Bobbyzio Moore, who with his spiky-kooky hair and herky-jerky stage moves complements Freddy Moore to an appallingly fitting degree (as a friend remarked, is it possible that both of these boys issued from the same poor mother?). Bobbyzio Moore on tenor sax and guitar and brother Freddy Moore on lead vocals and rhythm guitar, are the most colorful cats onstage. Once he sheds his guitar, frontman Freddy slinks about the stage and into the audience radiating the sort of cool assurance one associates with an aggressive tomcat. Although Freddy Moore is slenderly built along the lines of a Mick Jagger, he quickly demonstrates that housed in his slight body are a pair of superman lungs. He's a first-rate singer who punctuates his solid gutsy vocal delivery with earthy growls. Shortly after the Infinity Records fiasco lead guitarist Pete McRae departed. The four remaing Kats renamed themselves the Nu Kats , fired their management, signed with Rhino Records, recorded " Plastic Facts " and filmed the video "It's Not A Rumour" featuring co-writer, wfie and soon-to-be-famous actress Demi Moore , which went into rotation on MTV . Most manic of all is Clark Kent-ish Freddy Moore. While he appears totally in control on stage, in his personal life Moore is a one-man sandtrap. Once, on his moped, he crashed into a truck and broke both legs. His day-to-day turmoil includes knocking over drinks, and stumbling along in romance. In "Shoplifter" he sings about trying to cope while dreading the clobbering he'll get from his mom when she finds out. Actually Moore feels good about all these anxieties, as it gives him the inspiration for writing. The Nu Kats disolved in 1981. Moore moved to the upper westside of Manhattan and joined local NYC band "The Dates". "I answered an ad in the Village Voice that read 'Wanted: Lead Singer/Lead Guitarist influenced by Squeeze and The Beatles'". Moore became a Singer/Guitarist/Composer of The Dates "I loved NYC and had a lot of fun being a member of The Dates, it was nice to have Bob Fruhlingher handle the band leader duties, I was able to focus on what I enjoyed." While living in New York there was a family illness so Moore hopped on a plane for UCLA Medical Center. "I rang up Bob Fruhlinger of The Dates and asked them to liquidate my NYC possessions". Moore remained in LA and formed a new band called BOY (v1). BOY was more pop than any previous Moore band. BOY (v2) released a record on Radioactive and Freddy received a SAG/AFTRA card while portraying 'Arn' in the 3-D film 'Parasite' (BOY (v1) can be heard on the soundtrack. The Moore Brothers continued writing, arranging and recording new material for another year-or-so. They even put a band together and played a few industry showcases as: BFM (Bobbyzio and Freddy Moore). In 1985, after a 6 year relationship, Demi and Freddy divorced. Moore officially retired from the music business. Note: in 2005 Moore married his thrid wife Renee after several decades of courtship. When I was forced out of retirement by my day-job employers (1990) I wrote a bunch of new songs for The Kat Club! -note: "we still haven't finished recording them all!" "Freddy Moore & Dennis Peters <Acoustic Duet>"
Performing at acoustic songwriter showcases in L.A. The Kat Club! has released 3 CDs ('House Combinations', 'Source Mississippi' and 'los angelenos') and are currently tracking CD#4 'The Sixties' (coming soon). Revisiting the Mississippi 2000. Nicollect Island, Minneapolis, Minnesota. Demophonic Home Page. | Discograhpy. | The KAT CLUB Story. Copyright� 1964-2013 Demophonic Publishing BMI. All Rights Reserved.